A while ago I ran into the little book The Icelandic Rune-Poem (1998) by R.I. Page and later I bought his book An Introduction To English Runes (first published 1973, revised and republished in 1999). Page is a rune-scholar. In both books he writes about what he calls “cryptic runes”, runes in code. I have looked around a little and noticed that there is not much information to be found about this subject on the world wide web. There is a very short article about “Cipher Runes on Wikipedia and a handfull of references to it. The article does not say all that much though, nor does the rest of the information that I found on the internet. I do not claim to make a definate article about the subject, but I will at least give a bit more information. In an earlier article I wrote about what I called “bindrunes“, but I was actually quite mistaken. In the mentioned article I have a few examples of the strange cross-marks that I named “bindrunes”, notably of the famous Rökstenen. Actually, these are the simplest and most boring of the “cryptic runes”. On the right you can see a few examples from the Bergen runestone. Page speaks of isrúnar or icerunes formed with vertical strikes, lagorunár which are similar, but made with the lagu rune, stoprúnar which “employ dots set in horizontal line”, hahalrúnar in which reminds of the Týr rune, fiskrúnar or fish runes, svínrúnar or swine runes, skiprúnar or ship runes, skialdrúnar “where the decorate stem and stern of a ship”, knífrúnar “on the blades and hafts of knives and so on” (An Introduction To English Runes pages 82 and 83). There are a lot more forms. 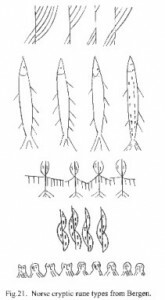 Only the fish-runes are on the right, the other forms are not mentioned. How fancy all these drawings look, the code is relatively simple. There are usually two sets of lines to be counted, left of the fish and right of the fish. The left side never has more than three lines (occasionally four), the reason for which is simple. The code uses a Futhark divided in aetir. In most cases, the number of lines or dots refer to the aet of the rune we are looking for, the number of the right to the place of the rune in that aet, an “F”, the first rune of a Futhark is 1/1, a “U” 1/2, etc. Of course it matters a great deal that Futhark is used. Some have 16 runes, some have 24 (the latter are sometimes divided in four aetir) and the order of the runes is not always the same, especially not between Scandinavian and continental or English runes. In any case, in a nutshell, this is the mystery. The runecarvers had a few more means of coding such as replacing vowels by consonents “so that lusaþ, ‘goes astray’, becomes lxsbþ” (p. 86) or by replacing a vowel by the next or previous vowel or by using Roman numbering to refer to runes or repeat a rune to make a number to refer to another one. Page names a few more. This in combination with the fact that the rune-masters of course did not write modern English using runes (who of us masters old-Norse for example?) and the fact that many rune monuments and manuscripts are heavily worn-out, makes these texts close to impossible to decipher. For a scholar even, so let alone an amateur. But you have to admit, as relatively simple as the system is, so fascinating it is to see a line of pigs and fish running through a manuscript. I just found out that Page’s book about the Icelandic Rune-Poem can be found online, so see that for more information and an image of the more fancy “cryptic runes”. The scan that I made is from the larger book about the English runes.